David Wilkerson has released a prophecy in 2009 that “AN EARTH-SHATTERING CALAMITY IS ABOUT TO HAPPEN” and recommends you get a 30 day supply of food. You may have heard that his church made 2000 sandwiches for rescue workers the day before 9/11. Before you worry about his warning, you may want to consider several problems with it and learn the truth about those 2000 sandwiches. 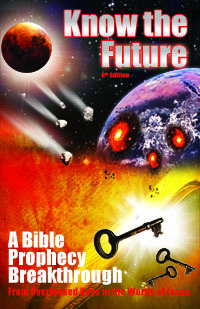 In the process you may learn how to debunk future false prophecies that are sure to come in these bad economic times. After reading this, I heard a story from WorldNetDaily about David Wilkerson being a “9/11 Prophet”. The story goes that “in the fall of 2001, Pastor David Wilkerson, of Times Square Church in New York City, was warned by God that a calamity was coming. For six weeks they felt an intense burden and enormous heaviness. For six weeks, there wasn’t a sermon. Instead, there was intercession for our nation with weeping and repentance”. Then supposedly on Sept 10, 2001, David Wilkerson felt God say they should make sandwiches. So they made them all night and had 2000 by morning, just in time to feed the rescue workers coming that morning for the World Trade Center attack on 9/11. The problem is that in reality, they made the sandwiches on 9/11 in response to the attack, not on 9/10 in response to the Holy Spirit. WND issued a correction later. I know some will come away from this article with the wrong idea that this is an attack on David Wilkerson. This article is a critique of his prophecy, not him. No matter how good we are, it does not give us a free pass for speaking improperly. Even though Wilkerson does not claim to be a prophet, he has claimed to speak for God which is what a prophet does. In the Christian community it is acceptable to say such things as, "God spoke to my heart that..." or "the spirit is impressing upon me to say" and not hold each other accountable for them. But the Bible takes false prophecy seriously. In Ancient Israel under the Torah, people were stoned for speaking for God falsely. Some will quote the phrase "touch not mine anointed" (1Ch 16:22; Ps 105:15) in defense of anyone pointing out problems with the conduct of a pastor like Wilkerson. But that application takes this verse out of its cultural and historical context. The passage has nothing to do with pastors or criticism. It refers to how God did not allow Israel's enemies to physically oppress her when they were vulnerable and few in number, including the Patriarchs. We can and should evaluate what pastors say against the Bible and hold them accountable rather than give them a free pass off a verse taken out of context. So how do we know that David Wilkerson's prophecy is false? There are several problems with what he said that disqualify his message from being from God. All of these problems stem from not fitting prior revelation that we have in the Bible. By knowing our Bibles we can have the discernment we need to test all spirits just as we are told to see whether they are of God (1Jn 4:1) The same principle is expressed in a verse telling us to check to see messages from spirits because if they are according to God's word it is because “there is no light in them” (Isa 8:20). In other words, we can conclude dark spirits are the source and discount the word if it does not fit prior written revelation. The first thing you may notice about his warning, is how unspecific it is. Something is going to happen at some time that would be considered a calamity. He mentions fires, riots and looting everywhere. No cause or source is mentioned, and no reason is given for the calamity. To a student of Bible prophecy it sounds nothing like the prophecies of the Bible that give such details. It sounds more like a horoscope. This does not disprove it, but it is the first of many red flags. Problem #2 – God's Wrath? For a person like David Wilkerson who understands that America is Mystery Babylon, it is surprising that he would call our current economic crisis “God's wrath”. When God's wrath falls on America, America will be destroyed, in a single day. That's what Revelation 18 tells us. So to say that we are already in God's wrath because of a simple recession is quite mistaken. It also diminishes the significance of God's wrath. When gods wrath fell in Sodom, it was destroyed. When God's wrath fell on ancient Israel, huge numbers of people died in plagues and other judgments such as the earth opening up its mouth and swallowing up whole clans. Later they were conquered by their enemies and deported due to God's wrath. To call a natural recurring part of the “business cycle” God's wrath falls flat. If you read the Bible carefully, you will notice that at no time does a prophet tell people to store up food in response to God's wrath coming. When God's wrath is pronounced the instruction is always for people to repent and seek God's favor in mercy. Even in the book of Esther we find that the righteous Jews Esther and Mordecai naturally decided to fast when they realized that there was a pronouncement of destruction against the Jewish People. Some might say the food supply preparation has a precedent in how Joseph stored up food in response to the word that he got from God. However, that was a different scenario. It was not a case of a word of warning of God's wrath coming. The famine that was coming was not the result of wickedness. It was just a famine which, like economic downturn, is a natural part of the food production cycle. Yet God decided to warn Joseph about it so that he and his people still up in Israel could be saved. Even if David Wilkerson gave a picture perfect prophecy, there still would be cause to doubt any prophetic message from him. In fact, given his own past, in my opinion he should have restrained himself from releasing this one. It turns out that David Wilkerson has uttered several failed prophecies before. For the last two years I have been crying aloud, warning all who would hear that America is receiving her last call and that judgment is at the door. I did not say this was the end of the nation, but the last call before a financial crash." (April 15, 2000). I am writing this letter to you on Saturday, April 15, 2000. I have on my desk the headlines in yesterday's paper: "BLACK FRIDAY - BIGGEST ONE-DAY DROP IN HISTORY." The Dow fell 618 points - the Nasdaq fell 355. I do not know what is coming in the next sixty days. If the market bounces back, I can assure you it will be temporary. THE CRASH IS INEVITABLE - NOTHING CAN STOP IT. After the market reached a record high, he confessed his error: "In prayer, I have told the Lord I am ready at any time to confess I am wrong - that I must have spoken from my own fears or that I have spoken unadvisedly. Recently, when the market reached record highs, I wondered if those calling me a false prophet were right." (May 22, 2000). Thanks to AsterickTom for collecting this information. Some have suggested that perhaps his prophecies did not come to pass because of people repenting. This is of course what happened in the case of Jonah's prophecy against Nineveh. The king proclaimed a fast and the judgment was delayed (although many years later Nineveh was still destroyed). However, there was no repentance like in Nineveh to excuse those failed judgments Wilkerson proclaimed. America kept on sinning as she always did during those periods. There certainly was no fasting like Nineveh or even a national day of prayer. A few people say David Wilkerson heard from God on 9/11 so we should listen to him. They offer as evidence how he canceled everything on the church calendar for six weeks leading up to 9/11 to focus on prayer. But such activity is not so special for a church. It could have been a coincidence. Even if we accept God inspired the decision to pray, we have to admit that this is a far cry from having an accurate public word about the future to point to as evidence David Wilkerson hears from God. What a great opportunity it would have been for him to prove his accuracy, by predicting one of the defining events in America's history. Instead, he remains as unsuccessful at predictions as all the other non-prophet prognosticators out there. Wilkerson is a godly man, but we must should not take his false prophecies lightly. Like most Christians he has not learned how to discern the spirits. When someone cries wolf like he has and nothing happens time after time, it has the opposite effect of leading people to repent. Instead it causes people to harden their hearts and ignore when real prophets come with real messages from God. So rather than defend his message we should hold him accountable for misspeaking so that he learns to not do it again. It is telling that David Wilkerson admitted back in 2000 that it was his own fears of the economy that prompted his failed prophecy. With a far scarier recession here in 2009 than 2000 was, it comes as no surprise that he would utter another false prophecy from his fears now. Given the times, I think we should be on our guard for more false prophecies. Keep this in mind and take them with a huge boulder of salt when you see them. I am also getting phone calls from visitors to my site who are in a panic. This is something new. The bad times have prompted them to investigate subjects on the Internet they would never have bothered with before including Bible prophecy. Some are reading all the rumors of concentration camps, martial law, dollar meltdown, the Amero, etc. and either thinking of or actually making plans to flee. They do not have the discernment yet to handle this information and debunk it. After all my practice at discernment, I've become very successful at calming them down and providing them with some much needed stress relief. I can relate to them as a person who left America after learning that America was doomed as Mystery Babylon. And I can explain to them how I figured out later that if it was time to leave, a prophet must come to warn and save all of God's servants, not just the paranoid, conspiracy theorist types. One person who recently called was planning on leaving Canada for Norway. I had to remind them that these are only rumors. And even if they are accurate, they are only plans of the enemy. God's plan will always trump man's plans. There is a good saying to remember, in this regard. It says, “Don't believe everything you hear and only half of what you see.” I think that with the Internet we should probably revise it to “none” instead of “only half” of what you see. For example, the so-called Amero coin is a hoax as you can confirm if you just look it up at www.snopes.com. This person's response was that snopes must be a disinformation site. Snopes is not perfect but it is the key goto site for the many false urban legends that all of us have had forwarded to us by friends. And it's not just snopes that debunks the Amero but many reputable sites have. It is important to check such sites because today people can photoshop anything into existence and post it on the Internet. Try to remember that the next time you see photographic proof of a conspiracy theory. And remember that if God wants to warn us of the future he will send a real prophet who does signs and works miracles just as all prophets have done in the past. (In addition to, of course, speaking in accordance with the teaching of the past prophets of the Bible--something the False Prophet will fail to do despite showing great signs.) Until you find a prophet with that kind of pedigree, you can safely assume the prophecy you hear is false. That is what ten years of hearing and watching words and prophecies and comparing them to the Bible has taught me.